Figuring out the terminology when it comes to EMF radiation can be a little overwhelming at first (or even after a while!) To be honest, i’m still trying to get my head around it. I put together this guide to give myself, and hopefully you, a better understanding of the units used in measuring EMF radiation. First, let’s talk about the basic measurements and why they’re important. When you think of EMF radiation, there are two important things to keep in mind, and that is the frequency of the radiation, and the strength of that frequency. The frequency of EMF radiation is usually measured in hertz. If you’ve read my articles on dirty electricity, you know that the electricity in your home, and at your office, is either 50 hertz (Hz) or 60 herts (depending on where you live). The FM radio in your car operates off of mega hertz (a million hertz) so 91.3 FM means that it is operating on the frequency 91.3 MegaHertz (MHz) or 91,300,000 hertz. Many of the devices that you are more familiar with, like your cell phone, your iPad, your computer, etc. that use WiFi or receive connection via cell towers do so in the GigaHertz (GHz) ranges. So if you’re phone is receiving 4G, that would be 4,000,000,000 hertz frequency. 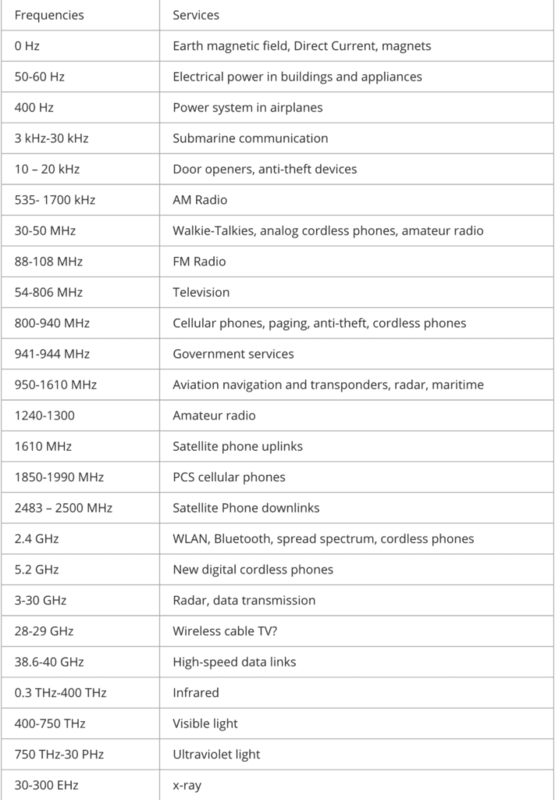 Take a look at the chart to the right to get an idea of all of the different services that use these frequencies. More often when we’re talking about the dangers of a particular source of EMF radiation, we’re talking about it’s strength. The strength of a radiation source is measured in several different units, including Watts, Gauss, Volts and many more. The unit being used will depend on many factors such as the type of radiation, the frequency, the region of the world, the medium etc. Ok, now lets talk about what units of measurements you should most commonly expect to see with each of the 3 types of EMF radiation: Radio frequency, magnetic fields, and electrical fields. When you’re thinking of radio frequency radiation, you need to remember that it has components of both magnetic and electric frequencies. So, you should usually express the strength of radio fields in separate terms specific to each of these components. For the electric field portion of radio frequencies, you will most commonly see volts per meter (V/m), and for the magnetic portion you will most commonly see amperes per meter (A/m). When we are measuring EMF radiation, it is usually measuring all of these components and their strength at a specific location. First let’s talk about the different conversions. Or if you want to jump down the the conversion calculator, just click HERE. Often when we’re measuring radio field EMF radiation, we think of it in terms of power density. Power density is measured most accurately when the measurement is taken in what is called the “far field” of the radiation pattern. See the image below for some clarity on this. Why it is important to measure the power density of EMF radiation in the far field, is that in the near field, the way that the magnetic and electric components of the EMF radiation make it extremely difficult to measure accurately. “Best” unit is a tough one to answer. I think for the purpose of this blog, which is focused on personal EMF radiation protection, the best way to measure would be in Volts per meter (V/m). First of all, V/m is fairly easy to understand. More importantly though, V/m is one of the best ways to measure they pulsing effects of EMF radiation, which is often considered to be the most harmful form of EMF radiation. Also, many of the best EMF meters, like the Cornet ED78S, give measurements in V/m. Most often when we’re converting RF, we’re converting between Watters per meter squared (W/m²), and our favorite, Volts per meter (V/m). Ok, blek, that was horribly boring, so let’s keep the train going, and talk about measuring magnetic fields, yahoo! Luckily, this is a bit simpler, because magnetic fields are also measured in units of Gauss, or Tesla. In North America, you will most often see magnetic fields measured in Gauss, but in most of the rest of the world, Tesla is more common. Knowing that even a weak magnetic field from a source of EMF radiation can cause damage to our bodies and health issues, you will often see both of these units of measurements in their smaller units, namely milliGauss, and microTesla (μT). Feel free to click Here to skip down to the conversion calculator. Luckily though, converting between the most common measurements for magnetic fields is actually quite easy. Measuring electric fields is the same as we measured them for their portion of radio field radiation above. The primary difference between the two is the scale of the measurement. For radio frequencies EMF radiation, like that coming to/from your cell phone, and from your WiFI router, we’re typically looking at the GigaHertz range, like 3g, 4g, etc. When we’re just looking at electric fields, like the wiring in your home, we’re usually looking at hertz. The wiring in your home is almost certainly 50 or 60 hertz. An EMF meter, like the ones I recommended above and talk about in a few of my posts, is a way to measure the electromagnetic radiation over time. It does this with a special type of antenna. Most meters are either single axis meters, or tri-axis meters. When we’re measuring EMF radiation, like magnetic fields, we are measuring them in a specific space, over time. Therefore single axis meters only have one sensor in them, so to get a correct reading you would need to stand still, and slowly rotate the meter in a circle (kind of like you’re spinning a plate in your hand) until you found the highest reading, and that will be the most accurate.